Blackwaters River Lodge is a lovely country guest house offering lots of activities and accommodation options to families and holiday makers. 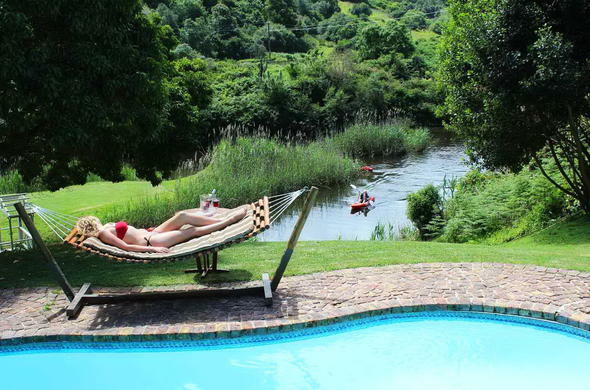 Blackwaters River Lodge is a leading country guest house in Knysna on the Goukamma River, with several hectares of pristine gardens surrounded by indigenous forest. This guest house in Knysna offers bed and breakfast accommodation, making it the perfect base from which to explore the Garden Route. Activities include canoeing, swimming, golf and bird watching without having to leave the property. In the morning you can enjoy a full English breakfast or continental breakfast, which is served in the breakfast room. By prior arrangement you can enjoy lunch at the pool or the pub at the golf course. A 3 course dinner can also be arranged or you can be driven to one of the lovely restaurants in Knysna itself.